There’s nothing like watching professional sports when you are a kid. The players are larger than life and the things they do on the field are seemingly impossible. They simply do no wrong. Before we were old enough to know about PEDs and DUIs and all the other off-the-field crap that grabs more attention than their actual play, these athletes were our heroes. That’s why childhood memories of our favorite players or favorite teams endure long into our adult lives. We hold on to the nostalgia of the way we saw the game when we were young because everything having to do with sports was so pure. With that in mind, we’ve reached out to local sports reporters, bloggers, and personalities to see which of their childhood sports memories have stuck with them more than all others. The first contributor to our series is Nick “Beerman” Staskin (pictured). 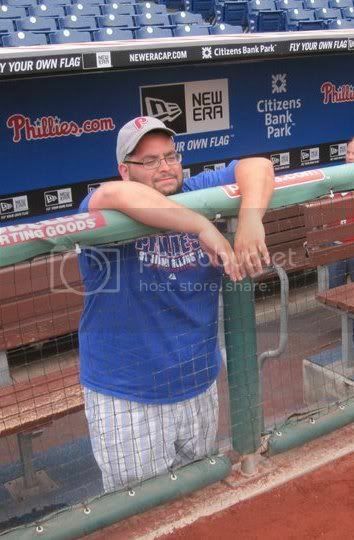 When Nick isn’t serving fans Miller Lite in left field at Citizen’s Bank Park, he’s writing for the excellent Phils blog, Phillies Nation. The memory that most sticks out in my head as a Phillies fan growing up is one that really had no meaning at all. When I was 14 years old, my dad took me to an early April game against the Atlanta Braves on a cold night. The reason? Curt Schilling was going opposite Greg Maddux. The game took exactly two hours to play and ended when Mike Lieberthal scored Greg Jeffries on an RBI single in the 9th inning to give the Phils a 1-0 win. Schilling and Maddux did not disappoint. Maddux went eight innings surrendering no runs and only five hits, but Schilling one-upped him throwing the complete game shutout while striking out 10 and only allowing two hits. Being there with my dad to watch two of the best pitchers of that era duel like that is something that I’ll never forget, and the reason I can’t wait to raise a baseball fan of my own one day. The game Nick remembers most took place on April 10, 1998. You can see the boxscore here. It was actually the second time that week Schilling faced Maddux. Just five days earlier, Schilling struck out 15 Braves en route to a 2-1 complete game win over Maddux in Atlanta. Schilling’s stat line that week: 2 wins, 0 losses; 2 complete games; 1 ER; 25 Ks; 6 hits; and, 2 BB. H/T to Nick for his contribution. He can be found on twitter here.